Ursula K. Le Guin is the world-renown author of the Earthsea Cycle, The Lathe of Heaven, The Left Hand of Darkness, and Lavinia. Several movies have been produced from her books. She has received many honors, including six Nebula and five Hugo Awards, the National Book Award, the Pushcart Prize, the Newbery Silver Medal, the Pilgrim, the Tiptree, World Fantasy Award for Life Achievement, Margaret A. Edwards Award, Boston Globe-Horn Book award, Pulitzer finalist, and at least 19 Locus Awards. Matthew Peterson: You’re listening to The Author Hour, Your Guide to Fantastic Fiction. I’m your host, Matthew Peterson. 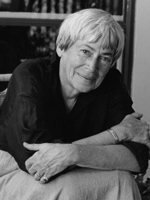 My next guest is Ursula K. Le Guin, world renown author of fantasy and science fiction, including the Earthsea Cycle, The Lathe of Heaven, The Left Hand of Darkness, and Lavinia. She has received many honors, including six Nebula and five Hugo Awards, the National Book Award, the Pushcart Prize, the Newbery Silver Medal, the Pilgrim, the Tiptree, World Fantasy Award for Life Achievement, Margaret A. Edwards Award, Boston Globe-Horn Book award, Pulitzer finalist, and at least 19 Locus Awards. Thank you so much for being on the show today, Ursula. Ursula K. Le Guin: It’s a pleasure. Matthew Peterson: You’re well known for your deep, thought-provoking novels for older kids and adults. How do you make your decisions on what age group you want to write for next? Ursula K. Le Guin: Oh, I don’t decide. The book decides. It comes and wants to be written. But I’m just sort of a . . . I facilitate the book that wants to be written. Matthew Peterson: . . . the book that needs to come out. Like the image inside of the block of marble. It’s in there, you just need to chisel it out. Ursula K. Le Guin: Yep. It’s in me and so I have to sort of make it somehow, so that it can come out. Matthew Peterson: Yeah. You have a new series called Chronicles of the Western Shore. You’ve got three books in there: Gifts, Voices, and Powers. Tell us a little bit about that series. Like in Earthsea, the wizards have lots of different powers. In Gifts, your first book, does every single person have a certain gift? Or just a few people? Ursula K. Le Guin: No, no, in Gifts, the powers of magic are kind of warped. They are mostly used aggressively and destructively and defensively, actually. You know, it’s like having that secret weapon that they use against each other. It’s all gone kind of sour, but the hero of the book, the protagonist, he has a different gift, it isn’t magic at all, in fact, it’s another kind of talent. And his problem is to realize that he doesn’t have the kind he’s supposed to have, he has this other one. Which is a problem, actually, a lot of young people face: What is my gift? You know? Matthew Peterson: Yeah. What’s my calling in life? Ursula K. Le Guin: And sometimes they’re expected to do something that just isn’t in them to do. So, I think a lot of us go through that. Well, you have another book that just came out, last year, Lavinia, which I’ve heard a lot of great things about. Tell us the basic premise of Lavinia. Ursula K. Le Guin: Well, Lavinia is a character in Virgil’s epic, The Aeneid. And she’s the girl whom the hero, Aeneid, is destined to marry. And so therefore she is also destined to marry him. She’s an Italian princess. This is all in the Bronze Age, you know, the time of the Trojan War. Ursula K. Le Guin: And in Virgil’s story, she doesn’t actually even say anything. She’s an extremely minor character. You just see her a few times, because Virgil had to describe the battles at that point. He’d done the love story with Dido and Aeneas and so he went to the battle part of his story. But I got really interested in this, who was this girl? And what does it all seem like to her? So, she sort of, as it were, started talking to me, telling me her story. The same story but from her point of view. And, I don’t know, I just got absolutely fascinated. The book was a real pleasure to write, it just sort of wrote itself. Matthew Peterson: And you know, it’s been a long time since I’ve read that lore, and I just remember Monty Python and the Holy Grail. [laughs] Everybody’s seen that, with the Trojan Horse. Ursula K. Le Guin: Yeah. Everybody still knows a little about that story, is what’s amazing. And golly, the Trojan War happened about 1200 BC. It happened an awful long time ago. Ursula K. Le Guin: We still know the stories. Matthew Peterson: Well, it’s such an interesting story. Ursula K. Le Guin: Yeah. It’s just one of the great stories. And so, you know, to kind of get in on the edges of it was a lot of fun. Matthew Peterson: Lavinia, so that just came out last year? Ursula K. Le Guin: Mm hmm. Matthew Peterson: I’m glad to see it’s republished. PBS did a film based on The Lathe of Heaven. Ursula K. Le Guin: In the ‘80s. Matthew Peterson: Yeah. I actually was up last night and I saw a clip of it. It was quite an interesting thing. Ursula K. Le Guin: You know, it’s a good movie. Ursula K. Le Guin: That’s the only good movie I’ve had made of my stuff. It was 1980 and our budget was about 32 cents, you know. Ursula K. Le Guin: The special effects are, well, they’re quite amazing. I could tell you that the war in space is [laughs] the photographer’s son throwing lighted frisbees. Ursula K. Le Guin: But you know, it worked. Because it’s not a special effects movie. It’s a movie about character. Ursula K. Le Guin: Yeah. So, I’m fond of that movie. And I’m really glad that PBS could re-master it, and so it sells along still. Ursula K. Le Guin: [laughs] Someday, watch it through, because the actors were really terrific. Matthew Peterson: Oh yeah. And I like that actor. It’s been a long time since I’ve seen him. And for those who haven’t read the book yet. It is a psychological thriller, I would say, about a man whose dreams change reality. Ursula K. Le Guin: Dreams come true! Ursula K. Le Guin: [laughs] Watch out if your dreams come true! Matthew Peterson: I know! Well, speaking of being a consultant on a movie, you’ve had your other movies. And I’ll just talk briefly about this, kind of like ripping open an old wound. [laughs] Your Earthsea books, which are just so popular, millions of people have heard of these books and read them. The miniseries was done on the Sci Fi channel [now SyFy] and an anime movie called Tales from Earthsea, which I haven’t seen ‘cause it hasn’t come out yet, in the U.S. But I did see the miniseries a few years ago. I understand you weren’t too happy with what the director did with your series. Ursula K. Le Guin: Oh, he took the name of Earthsea and the names of the characters--actually the same thing happened in the Japanese version--and then they just sort of, they took those names and then made another story with them. And the American one was all sort of violence, and I didn’t understand the point of their story or what it was about, really. I think it’s a very strange thing to do, to take a name, a title, and characters’ names and then just sort of run off and do something you want to do with them without any reference to the original story, which an awful lot of people know, as you said. Sort of like taking War and Peace and calling people Andre and Natasha and so on and then making a different story. Why do that? Why not make up your own story if you want to? Ursula K. Le Guin: I just don’t get it. Matthew Peterson: And you didn’t have any say, really. I mean, you wrote the book . . . .
Ursula K. Le Guin: Oh, no! Oh they were going to respect my wishes and yeah, yeah, yeah. In a pig’s eye. The movie was being made before . . . [laughs] . . . they mispronounce names in it, and so on. They could have asked me how to pronounce the names. They didn’t even bother to do that. Matthew Peterson: Yeah. Well, like earlier I called your book Laveenia, and you said, Lavinia, and I was, “Oh, I can see little mistakes like that.” That’s where the author comes in handy and . . .
Ursula K. Le Guin: I know how annoying authors can be to film makers. ‘Cause the film maker has to have his own vision of the movie. I understand that; I’ve written screenplays. It’s not like I’m arrogant about my books, I think, but there should be a relationship between the thing on the screen and the words in the book. Matthew Peterson: [laughs] Yeah. Exactly. Well, I did see the movie. And I saw that Danny Glover was going to be in the movie, and I love Danny Glover, you know. So I was all excited to see it and . . . yeah, I do agree it was different. The name was the same. Matthew Peterson: Yeah. Let’s just put one person with colored skin, and that’ll appease everybody else who’s read the books. Ursula K. Le Guin: Yeah, yeah, that’s right. As if by white washing, you know, you can . . . [laughs] . . . I just don’t know. Matthew Peterson: Yeah. I was late last night reading all these articles, because a lot of people were kind of a little bit in an uproar about that topic. Ursula K. Le Guin: There was some proper indignation, I think. Matthew Peterson: Yeah. It’s one of those things, that . . . you know, I live in America, I lived in a white neighborhood, my entire school, we had just a little bit of color in the school and so that’s what I grew up in. I was at a presentation the other day, at a school presentation, for my book that I had written. And I remember this muscular, good looking, African American boy came up to me and he said that if they ever made a movie out of my book, Paraworld Zero, he wanted to play Butch, the antagonist of the story. And it really kind of took me by surprise because up to that point I’d always pictured Butch as some white kid. But I thought, you know, why not? And so now ever since that experience, now when I think of that character, Butch, I think of him with darker skin. Ursula K. Le Guin: Interesting. One reason this annoyed me so particularly with Earthsea was that when I wrote the first book of Earthsea in 1968, a long time ago, I consciously decided, everybody in fantasy at that point was lily white, believe me. There wasn’t a whole lot of fantasy then, you know. Tolkien was writing, but I didn’t know his work yet. And the fantasy tradition was a kind of a northern European white folks thing. And I thought, “How come?” So, I just, I made my villains--a few villains in it tend to be white, in the first book, and everybody else is brown or black. Ursula K. Le Guin: But I don’t say very much about it ‘cause I figured that would kind of put off a lot of white kids. We’re talking 1968, remember. Ursula K. Le Guin: So, I just didn’t say much about it until kind of well into the book, and figured, okay, now you’ve kind of identified with Ged, he’s the hero. Maybe now I’ll tell you that he’s sort of a brown copper color. He ain’t a white man. [both laugh] You know. And nobody said a thing about it, for years. On the covers they generally represented the people as pretty white. Because that was, “Oh, covers with black people on it, they don’t sell.” And you know what’s kind of touching is that recently I’ve been hearing from grown up, middle aged people of color who tell me that the first fantasy they were able to read was my Wizard of Earthsea . . . because they were in it. Ursula K. Le Guin: And they weren’t in any of the others. But you know, for years, I kind of wondered if anybody noticed. Yeah. People did notice. I was very touched by that. Matthew Peterson: That is good. Well, that’s about all the time we have for this interview. I really do enjoy speaking with you. I’m so glad that you’ve been on the phone. I’ve been speaking with Ursula K. Le Guin, world renown author of fantasy and science fiction. It’s truly been a pleasure speaking with you today, Ursula. Ursula K. Le Guin: Thank you, Matthew, I’ve enjoyed it. Matthew Peterson: Okay, everyone, make sure you go to www.TheAuthorHour.com to listen to the bonus questions. Stick around. I’ve got Brian Herbert and Kevin J. Anderson, the co-authors of the international bestselling Dune novels, coming up next.